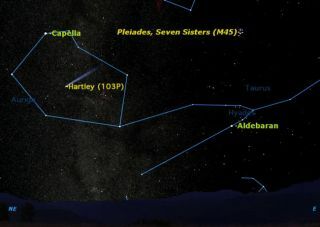 This sky map shows where to look to spot Comet Hartley 2 during its closest approach to Earth in October 2010. The comet makes its closest pass by Earth on Oct. 20, when it will be framed by the bright stars of Auriga in the Capella constellation. This week a fairly bright comet is visible in thenortheastern sky and makes its closest approach to Earth tomorrow (Oct. 20),though it may be difficult to spot without clear conditions well away from citylights. For a few nights at mid-week, Comet103P/Hartley 2 will be perfectly placed in the bright circle of stars thatform the constellation Auriga. This sky map shows where to look to spot the comet, weatherand lighting conditions permitting. Binoculars or a small telescope are advisedto obtain the best viewing conditions. Bright comets are rare, perhaps one every three to fiveyears. It's impossible to tell far in advance how bright a comet may be. CometHartley 2 was discovered by Australian astronomer Malcolm Hartley 24 yearsago. It?s only in the last few days that it has become bright enough to bespotted with binoculars or the naked eye. This SPACE.com CometHartley 2 skywatching guide describes how to see the celestial event. It is best viewed with 10x50 to 20x80 binoculars from adark sky location. If using a telescope, choose the lowest magnificationpossible. Like the famous Halley's Comet, Comet Hartley 2 is aperiodic comet that follows a years-long loop around the sun. It takes 6.46years to complete one circuit, compared with Halley?s 75.3 years. Unlike some comets, Hartley 2 never crosses the Earth?sorbit, so it is high in the night sky when it makes its closest approach. Itwill be closest to the Earth on Oct. 20 at 3 p.m. EDT (1900 GMT), and closestto the sun on Oct. 28. At its closest, Comet Hartley 2 will be only 0.12astronomical units (11 million miles, or 18 million km) from the Earth. On Nov. 4, this comet will have a visitor from Earth, whenthe probe Deep Impact does a flyby. It will pass only 435 miles (700 km) fromComet Hartley 2.